Hormone Therapy for Menopause: Is Hormone Therapy for Me? To Use or Not to Use Hormone Therapy for Menopause? Some women are terrified by the prospect of hormone replacement therapy (HRT) thanks to scary stories in the media over the years, but the good news is that nowadays there are many different ways of replacing your dwindling hormones. You’ve probably been driven by frustration to consider going to the doctor’s office with symptoms of menopause you can’t just live with. You probably feel a bit of a failure for even thinking about resorting to help from medications. That’s perhaps why you are researching your options on websites like this one! No one but you can make the final decision about what is right for you but one thing is fact – there are so many types of HRT and methods of delivery that you are sure to find one which can alleviate the symptoms which may be making your life a misery. It’s not a case of one size fits all, and neither is it true that taking HRT is meddling with nature or cheating. 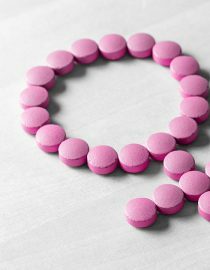 Statistically, the benefits of HRT outweigh any risks for women under the age of 60. It’s particularly effective against hot flashes and can help with sleep issues, muscles aches, and pains and mood swings. HRT can also be beneficial for those women suffering from depression and/or anxiety and for women with vaginal dryness, atrophy and other genital issues and bladder problems. One of the lesser known benefits of HRT is the fact that it can protect against osteoporosis (loss of bone density) and brittle bones which can develop as estrogen diminishes. Even low doses of estrogen can give bones protection and women who take it long term enjoy a significantly lower risk of suffering fractures. There’s also evidence to show the protection continues for some time after HRT is discontinued. What Are the Downsides of Hormone Therapy? Like all medication, natural or manmade, there is always a risk of side effects. HRT comes in a wide range of combinations, sometimes just estrogen, sometimes estrogen combined with progestogen. It may take some time and some trial and error to find the combination which suits you. In the mean-time you may experience breakthrough bleeding, breast tenderness, bloating, leg cramps, headaches, pelvic pain or pre-menstrual tension. Be prepared to have to wait weeks or even two or three months for HRT to start working entirely but if side effects are bothering you get in touch with your doctor who may decide to try another brand or combination earlier. Studies, on the whole, are inconclusive but it’s thought that there may be a slightly higher risk of stroke, venous thromboembolism (VTE) and pulmonary embolism and some forms of cancer. However, as mentioned previously, generally the benefits outweigh the risks for most women. Your doctor will be able to advise if you are in one of the groups at higher risk but to put it into perspective, some of the risks associated with HRT are similar to those for obese women, those who drink two or three units of alcohol a day or who have early menopause. Some forms of breast cancer are less likely to occur in those on HRT. Even increased risks disappear once a woman discontinues HRT. Is All Hormone Replacement Therapy in Tablet Form? Most doctors will start with a daily tablet form of HRT, but you can take it in other forms. There are transdermal (skin) patches, a bit like the nicotine replacement ones you stick on when giving up smoking, gels, and cream you can rub into your skin and pessaries and vaginal rings. The patches are usually changed twice a week, and the gel or cream is applied to your skin daily. The tablets are typically taken daily. If you still have a womb (uterus), it is important that a progestogen is combined with the estrogen. When you take estrogen the lining of your womb can build up which can increase your risk of cancer. However, taking progestogen reverses this risk. If you still have regular periods, then you will be given a type of HRT than still gives you a bleed like a monthly period (it’s not a period, but technically a withdrawal bleed). If you have not had a period for one year, then it is more likely you will be offered a type of HRT which does not give you a period. Don’t panic if you have some light bleeding or spotting in the first few months of using this type of HRT. However, if you experience heavy or prolonged vaginal bleeding, then you need to inform your doctor. It’s probably nothing to worry about but best to check. If you have a history of a clot, migraine, diabetes or liver disease, then you can still take HRT, but it is likely that you will be advised to use a patch or gel rather than a tablet. The progestogen may still taken as a tablet though. Is There a Natural Form of Hormone Therapy for Menopause? Some women aren’t able to or don’t want to take prescribed HRT, and a quick glance along the drug store shelves will tell you there are a lot of alternative HRT therapies. None of them will offer the same bone protection of HRT but may help with reducing bothersome symptoms. Well known remedies include Red Clover, Black Cohosh, and St John’s Wort but be very careful and check with your doctor before starting any alternative therapies as they can be very potent and may react negatively with other remedies and prescribed drugs. Consider consulting a qualified and registered herbalist or alternative therapy practitioner rather than choosing from the grocery store shelves. Acupuncture, acupressure and magnet therapies work for some women and aromatherapy can be beneficial for alleviating anxiety and depression and for helping sleep issues. Lifestyle changes are the most effective natural drug-free way of alleviating symptoms. Hot flash frequency can be cut down with layered clothing, reducing stress and eating a healthy diet. Sleep issues and depression respond well to a proper diet and relaxation sessions which can be as simple as making time for yourself. Most women find a combination of HRT and lifestyle changes are the most effective at reducing all menopause side effects to a bearable level. If you are in the perimenopausal or menopausal stage of your life, you may want to consider using herbs for menopause to relieve discomfort.